"Mums know more than they let on." "They say it's natural for mothers to be protective of their kids. I don't see why. They need protecting as much as we do." 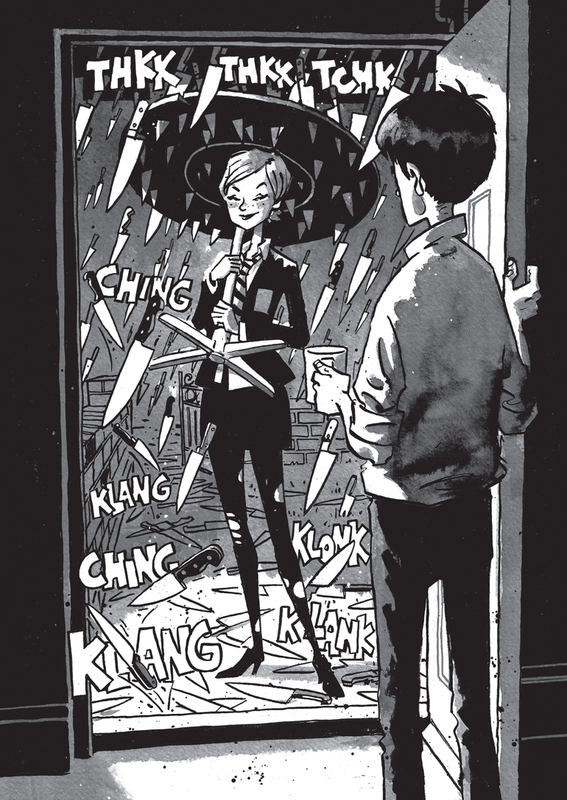 Welcome to a graphic novel that is so wickedly new and so densely inventive that comparison points virtually elude me. Its warped reality reminds me of Gorillaz tracks with their attendant videos. There are weather clocks issuing knife-storm warnings; instead of the goggle box there's a Daily Wheel to watch; and teenage Scarper Lee may not know his birthday but he certainly knows his deathday: it's in three weeks time. 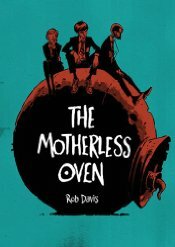 I shouldn't be surprised and I'm not: THE MOTHERLESS OVEN comes from Rob Davis, the creator of THE COMPLETE DON QUIXOTE and the instigator, director and chief writer of NELSON, another all-time classic which - like the equally original THE NAO OF BROWN - won the British Comic Awards for best graphic novel of its year, deservedly. Everything here will sound so very familiar although almost everything here has been turned on its head. Truths are often much more enlightening when seen from a fresher perspective. It is a truth universally acknowledged, for example, that children are created by parents - not just by procreation but by osmosis as well: nature and nurture. The behaviour of parents rubs off on their progeny. But even without the following reversal, the behaviour of children must surely, similarly, rub off on their parents? Or at least wear them down. Or buoy them up. We just haven't given that enough consideration yet. But what if children created their parents? We might look at things differently then, and so now we do. "We were sat on Peter Cake's Mum as usual. Pete's Mum used to be a dinner lady at the school. She had a breakdown in the playground a few months back and no one has come to pick her up yet. It's funny, Pete never used to go near her when she was working." It is so typical of Rob Davis' love of language that he bestows on the word "breakdown" two different meanings with identical results. 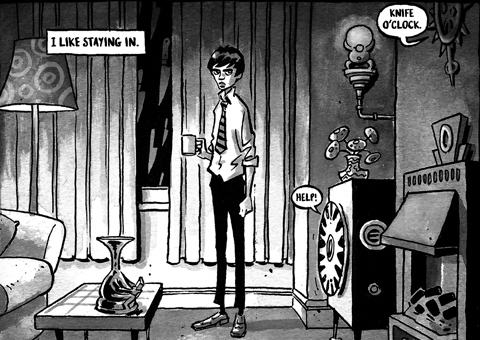 In THE MOTHERLESS OVEN, you see, children fashion their parents as paintings or mechanical objects as if made from Meccano, and Pete's Mum had a physical breakdown like any old car and a mental breakdown like any highly stressed, under-paid, overworked parent trying to provide with a job. Now she just lies there where she fell, inert, like so much scrap metal. They sit on her. "Turned out today is the day they tow Pete's Mum away. They'll take her to the Mother Ruins, unless Pete's Dad can get permission for a permanent residence in their front garden. He wants to turn her into an ornamental fountain." Another play on words: Mother's Ruin becomes Mother Ruins and wait until you see that nurseless nursing home. Scarper Lee isn't a misanthrope. He actually cares. He's just very private and prefers sitting at home. He'd rather not be bothered with people. Then along comes Vera Pike, the most bothersome girl in the world, and Scarper Lee can't get her out of his head. She's direct, disruptive and completely unphased by the weather. She'll even go out in a knife storm, carrying a thick wooden table over her head like an umbrella. "You don't like the laughing gales, then? You do realise the wind isn't laughing at you, don't you? I mean, you're not so vain and neurotic as to think that, are you, Scarper?" I know for a fact the wind is laughing at me. "Having said that, if the wind is laughing at you, you might as well just laugh along, right?" Needless to say, at school she's immediately shunted off into the deaf unit where all the kids with "special needs" go - just like Castro, whom she calls her "new toy". Castro has "medicated interference syndrome", with a "brain aid" to modulate his behaviour. "Just watch him go when I turn it all the way up! Ask him a question. Go on, Scarper, ask him anything!" "Y'alright, mate? Your nose is bleeding! D'you need a tissue?" I told you he cared. Scarper cares most about his Dad, a brass, land-bound boat yacht whom he polishes meticulously every Sunday, tightening his seals. He keeps his Dad chained up in the shed for his own safety, though on Saturdays he'll sail down the pub, as you do. "Saturday is the day when I feel like I can see the horizon. It's the day that doesn't ask for anything and is happy with what you give it." That's a fabulous page: a small-town high street on a sunny day with a thrilling, open perspective. There are shops, snap-frame A boards and Scarper himself, idling along the pavement in a striped jumper and jacket and tight, black denim jeans. You might not even notice the parents being driven down the road. Davis' designs on the Daily Wheels are well worth studying closely, but it's his faces and figure work I love most: lithe forms with slim legs, and Scarper's bushy hair, bulbous bottom lip and eyebrows as thick as big, black caterpillars frowning deep over his eyes. 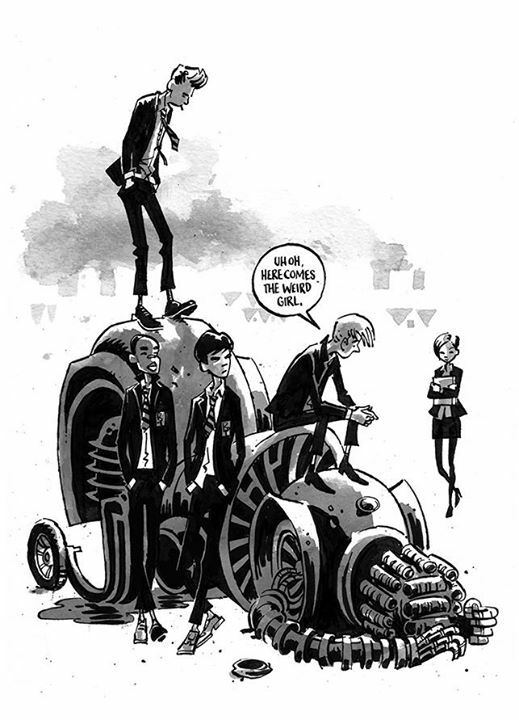 Ian Culbard told me Mike McMahon is a huge influence on Rob and I can see that, transformed here into something a lot less angular and cheekier so I'm sticking with my Jamie Hewlett comparison. It creates a stark contrast with the sculptures, murals and trundling mechanical objects which are everyone's parents. The grey, pen-brush washes are warm and soft, while the knife storms - kitchen-knife storms - are stark and sharp and I'm never going to complain about hail again. "He did all his lessons that day and afterwards played for the school football team against the local girls' school. Thirty minutes in, a big girl with an eye patch stood on his leg and snapped his shin. The poor fellow bled to death on the halfway line. "The boy's father remained in the lost property box for years. The mother went quite doolally, I'm sad to say. "She had a propeller hairstyle, all the rage in those days - damn thing went into a hysterical spin cycle. Ripped her head off her shoulders. It flew around the school for weeks before the groundsman shot it down." 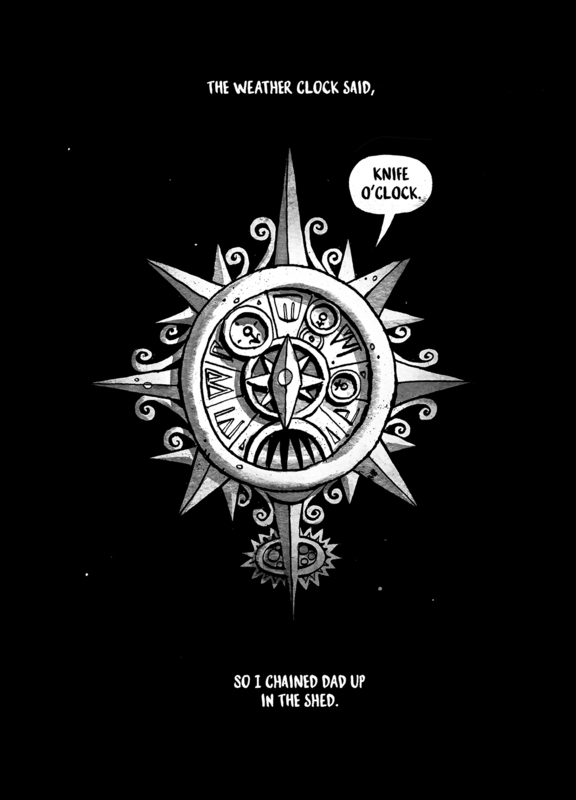 So with his deathday approaching and the clock ticking inexorably on, what will Scarper Lee do with the little time left? Momentum doesn't seem to be something he's ever built up. He'll probably just stay at home with his Mum and Dad.